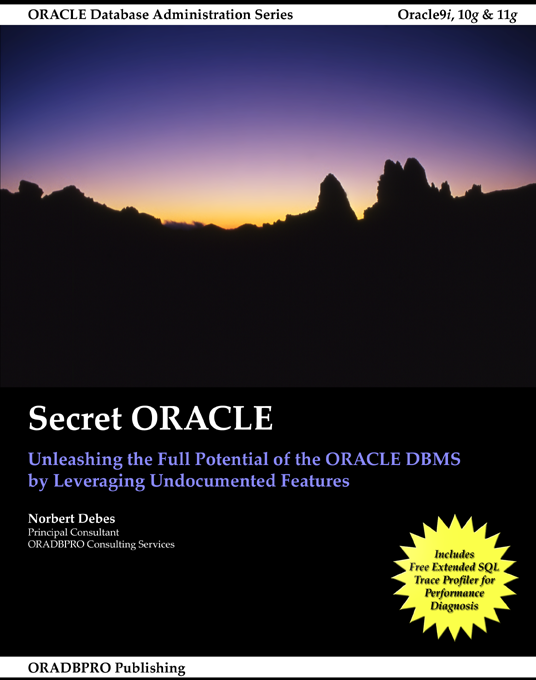 Secret ORACLE is the definitive guide to undocumented and partially documented features of the ORACLE database server. This book will improve your efficiency as an ORACLE database administrator and enable you to master more difficult administrative, tuning and troubleshooting tasks than you ever thought possible. Many undocumented features are very stable, even more stable than numerous documented features. The very useful SQL*Plus command ORADEBUG, which has been around since Oracle7, is a prime example. Hence the material presented in the book will not become obsolete as the next major release appears, but most of it will remain useful for many years to come. Secret ORACLE is featured in the book review section of the Northern California Oracle Users Group Journal (November 2008). 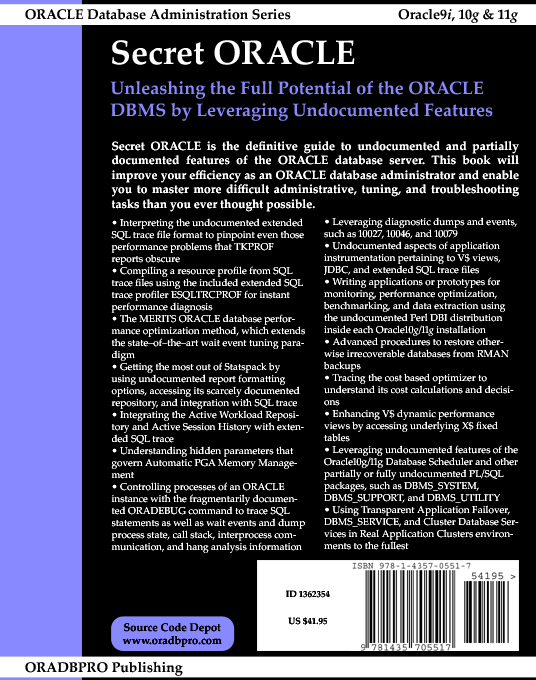 The review was written by Brian Hitchcock, a Senior Oracle DBA at Sun Microsystems and a frequent speaker at Oracle OpenWorld. Brian recommends Secret ORACLE to other readers with DBA experience and is convinced "that a junior DBA could benefit as well". He is impressed by the amount of new information he learned and by the overall quality: "I just finished reading a book from Oracle Press that had many errors, both typos and factual errors. I was surprised that a self-published book would have many fewer errors than a book from a major publisher." While he cautions the reader against actually using undocumented features, he acknowledges that the book does a great job at explaining the undocumented aspects and inner workings of certain documented features, e.g. PGA_AGGREGATE_TARGET, V$SESSION_WAIT, V$OBJECT_USAGE, and Advanced Queuing: "Learning about undocumented features can help you use the normal features better." This quote from Brian's review says it all: "How much did I like this book? In the first 30 pages I found so many things that I didnâ€™t know but that I think are worth knowing that I canâ€™t describe them all to you in this review. Thatâ€™s how good this book is." Secret ORACLE received an enthusiastic review by DOAG News, a publication of the German Oracle Users Group DOAG (volume 2/2008, ISSN 09 36-0360). The reviewer was impressed by the amount and depth of information on ORACLE database performance optimization and praises the large collection of highly useful scripts provided to the readers. The chapter on Statspack was well received due to a procedure for finding the most resource intensive Statspack snapshots in a repository of hundreds or even thousands of Statspack snapshots. The reviewer also liked the chapter on the MERITS Oracle database performance optimization method. The MERITS method is a six-step approach (Measure, assEss, Reproduce, Improve, forecasT, inStall) to performance optimization that emphasizes accurately measuring and diagnosing performance problems thus eliminating trial and error. Click here to read the review. Please send valid Lulu order number and date by e-mail to ORADBPRO Publishing to receive the enhanced profiler (see tab Contact for e-mail address).